Restore comfort with Avène's Sensitive Skin Saviour Kit. Combining two delicate cleansing lotions, a refreshing spray and a cooling cream, you can experience calmed, soothed skin and reduced sensitivity long term. E.N. Specially developed for fair, thin and sensitive skin that has become irritated due to climatic conditions, dermatological treatments or dryness. With a mild plant-based cleansing formula to gently remove dirt, make-up and impurities, the refreshing cleanser soothes skin to leave it with long-lasting comfort. Enriched with the brand's Thermal Spring Water and patented ingredient Parcerine® to reduce reactivity so you can experience calm, hydrated skin. Refresh skin with the Thermal Water spray. Its unique formula soothes hypersensitive, allergic and irritated skin by leaving a barrier on the skin to deliver long-lasting comfort and reduce itching. The versatile spray can be used by the whole family and is ideal for cooling sunburn, nappy rash and razor burns caused by shaving. With a gentle formula containing minimal ingredients, the calming cream soothes irritation and restores the skin's natural hydrolipidic film to retain moisture. Enriched with the brand's Thermal Spring Water to deliver long-lasting comfort. Ideal for fair, thin and sensitive skin or irritation caused by climatic change, dermatological treatments or dryness. Avène Extremely Gentle Cleanser Lotion: Apply morning and evening with a cotton pad or your fingertips to the face, neck and eyelids in a light circular motion. Wipe gently without rubbing with a make-up remover pad. Avène Thermal Spring Water: Spray onto the skin in a fine mist. Wait for a few seconds, then gently pat dry. Avène Skin Recovery Cream: Apply morning and night on a perfectly cleansed face and neck. 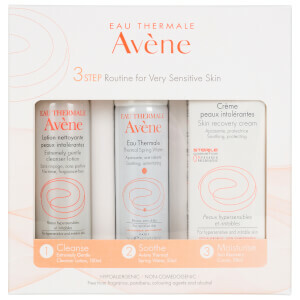 Avène Extremely Gentle Cleansing Lotion: Avène Thermal Spring Water (Avene Aqua), Cetearyl Alcohol, Serine, Cetrimonium Bromide, Coco-Glucoside, Dipotassium Phosphate, Disodium Edta, Disodium Phosphate, o-Phenylphenol, Sodium Cetearyl Sulfate, Water (Aqua). 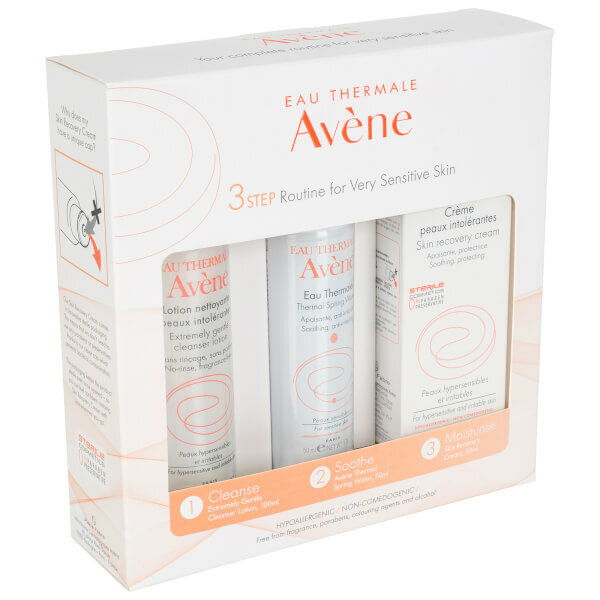 Avène Thermal Spring Water: Avène Thermal Spring Water (Avene Aqua), Nitrogen. Avène Skin Recovery Cream: Avène Thermal Spring Water (Avene Aqua), Mineral Oil (Paraffinum Liquidum), Glycerin, Glyceryl Stearate, Squalane, Cyclopentasiloxane, Cyclohexasiloxane, Serine, Carbomer, Tetrasodium Edta, Triethanolamine, Water (Aqua).